Fishing is a seriously tricky business full of lucky hats, treasured poles, and a plethora of old wives’ tales and superstitions. Here are some of our favorite superstitions believed by anglers everywhere! One of the oldest and longest running fishing and boating superstitions says that bringing bananas on your fishing trip is bad luck. Back in the 1700s, ships that disappeared at sea all carried cargos of bananas, and people believed poisonous insects in the fruit killed the sailors. When ships would wreck, other ships would come across them to find bananas floating among the wreckage, causing people to associate bananas with bad luck. Bananas also attracted termites that easily destroyed the wooden boats our angler ancestors sailed in. In order to conduct a successful fishing trip, you must throw your first catch back into the water. 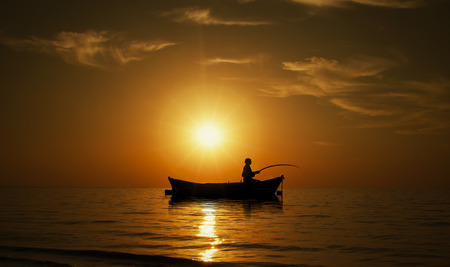 It is believed that if you refuse to do so, you won’t catch any more fish for the day. This superstition also includes a way to increase your good luck – just kiss or spit on the fish before throwing it back. Similarly, some fishermen believe the first person to catch a fish in a fishing party will obtain good luck for the rest of the voyage. Throwing the first fish back in the water is like giving a gift back to the water you hope to take from again later. Relaxing often leads to whistling as you happily hum your merry tunes while floating on the open water. However, fishermen beware: whistling may soon bring bad luck. The whistling superstition exists because many believed that whistling stirred up storms by encouraging the wind; some modern fishermen still believe the sounds scare the skittish fish away. It may be a good idea to leave the bananas at home for your next fishing trip—just in case! Still planning out where to cast your line? Consider visiting us at Mattice Lake Outfitters in Northwestern Ontario and fishing along the Ogoki-Albany river system. Give us a call at 1-800-411-0334 to learn more about outpost camps and wilderness lodges!